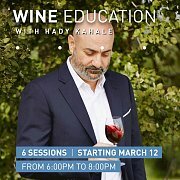 This 6 sessions course is a complete presentation on wine. It focuses on tastings while explaining wine fundamentals: how wine is made, how wine is tasted and enjoyed, how to be the perfect host while serving wine and choosing the best pairing with food. In the second part, it focuses on the main winemaking regions of the world: France - with Burgundy, Bordeaux and Rhone, Italy and Spain, and the main regions of the “New World” without forgetting one of the oldest winemaking country in the world, Lebanon!